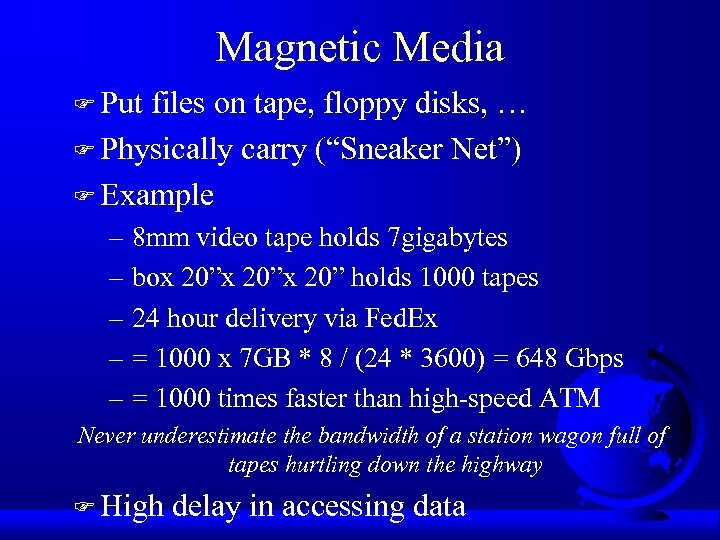 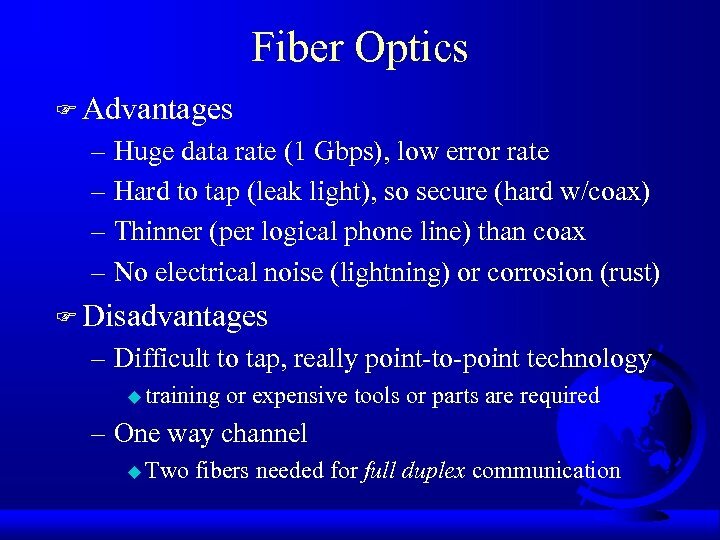 Purpose of Physical Layer F Transport bits between machines – How do we send 0's and 1's across a medium? 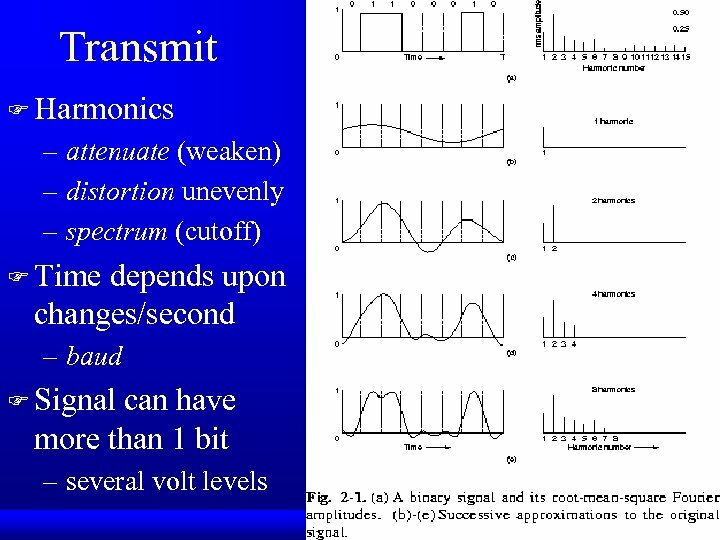 – Ans: vary physical property like voltage or current F Representing the property as a function of time – analyze it mathematically F Does the receiver see the same signal generated by the sender? 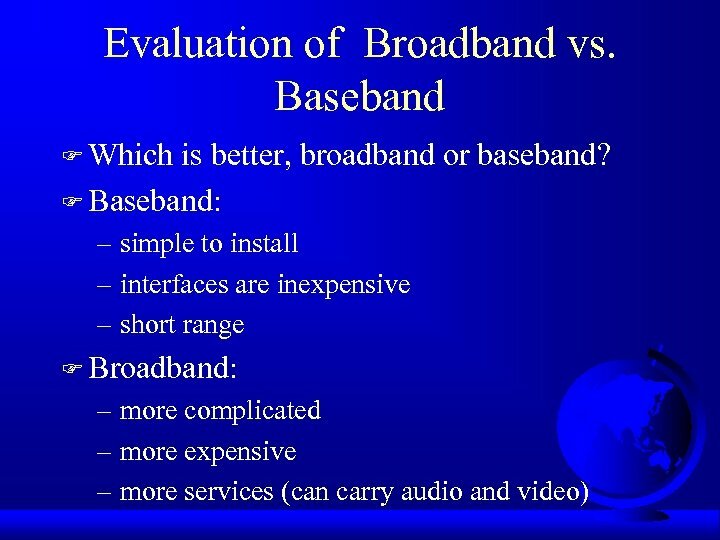 – Why or why not? 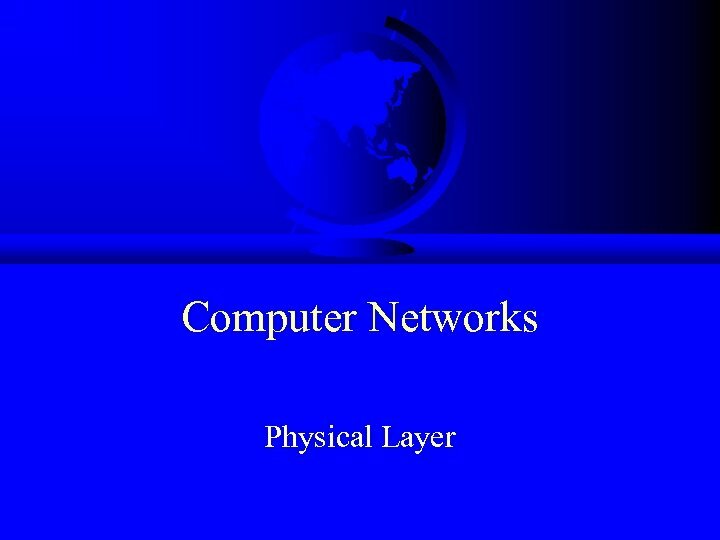 Review F How many layers are in the OSI reference model? 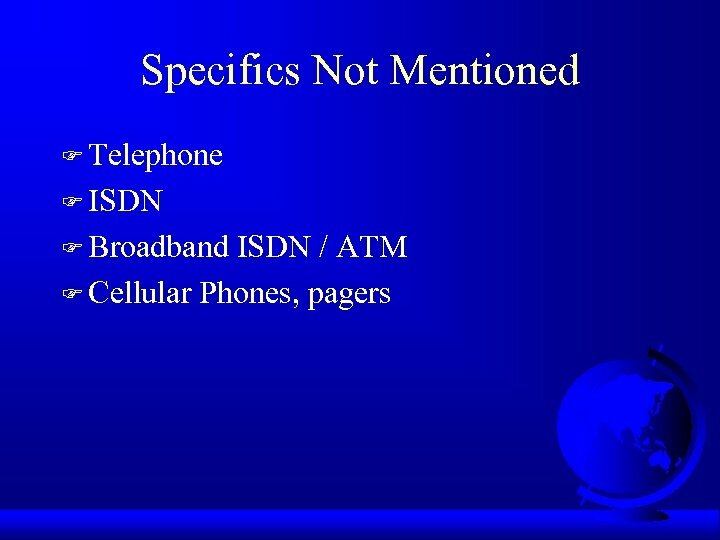 How many in the TCP/IP reference model? 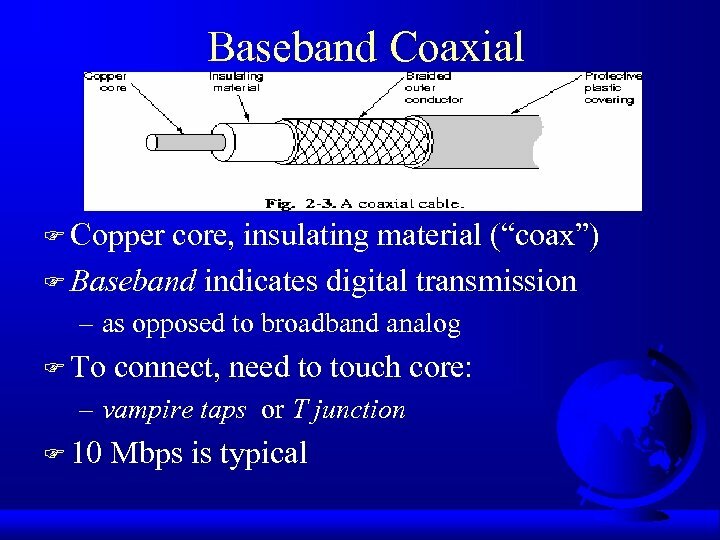 F What are the layer differences? 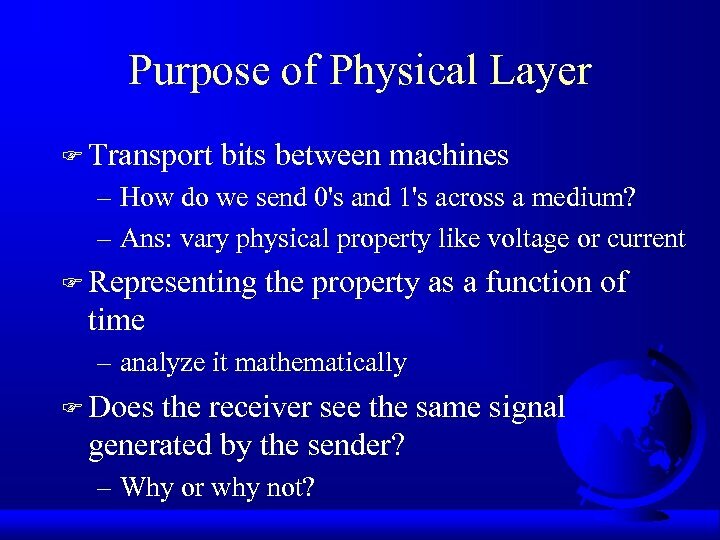 F What is the purpose of the Physical Layer? 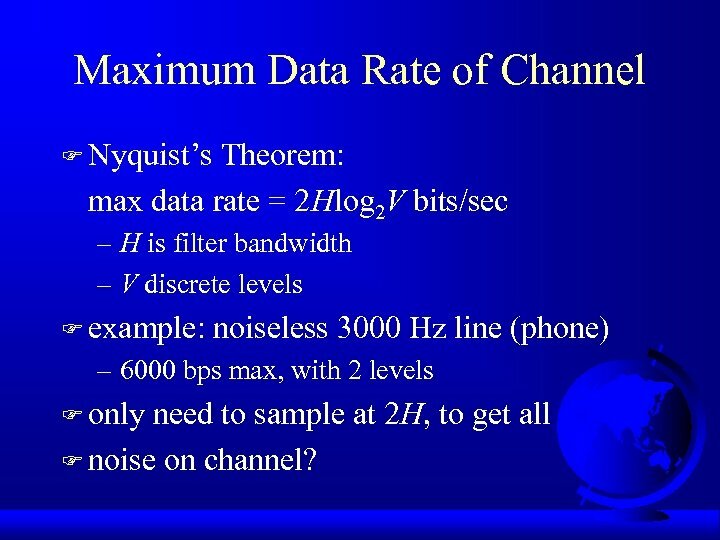 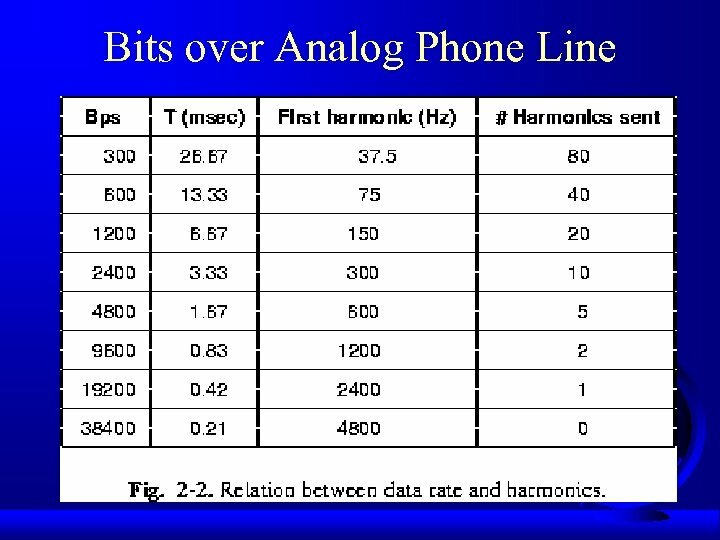 Maximum Data Rate of Channel F Nyquist’s Theorem: max data rate = 2 Hlog 2 V bits/sec – H is filter bandwidth – V discrete levels F example: noiseless 3000 Hz line (phone) – 6000 bps max, with 2 levels F only need to sample at 2 H, to get all F noise on channel? 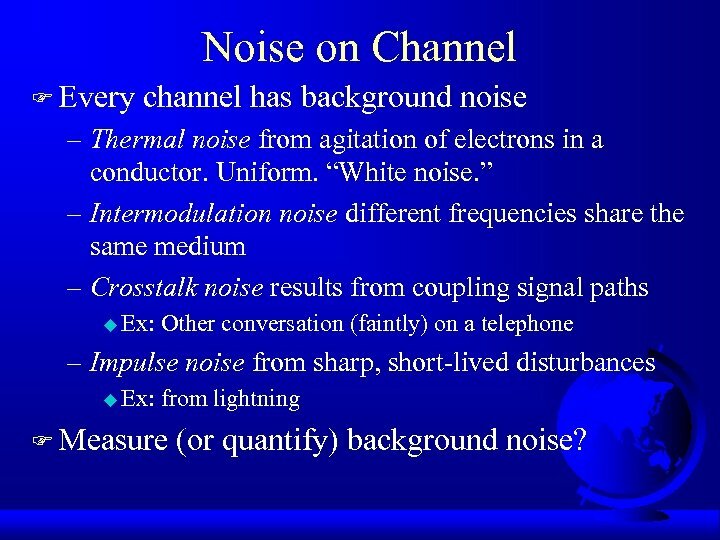 Noise on Channel F Every channel has background noise – Thermal noise from agitation of electrons in a conductor. 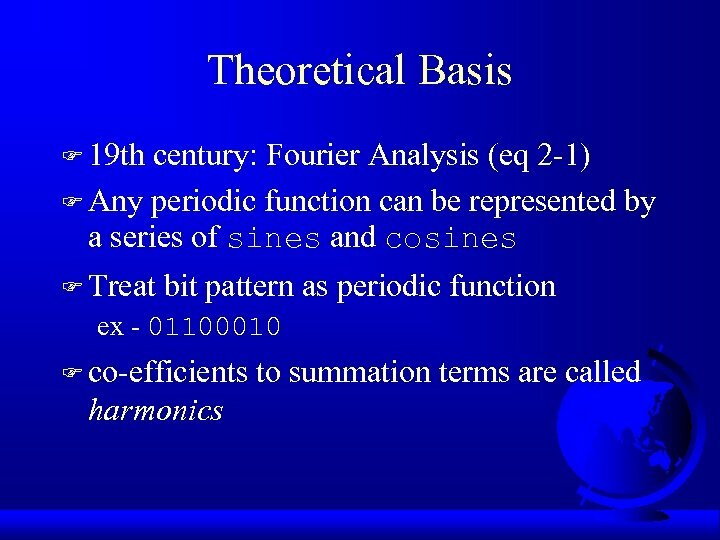 Uniform. 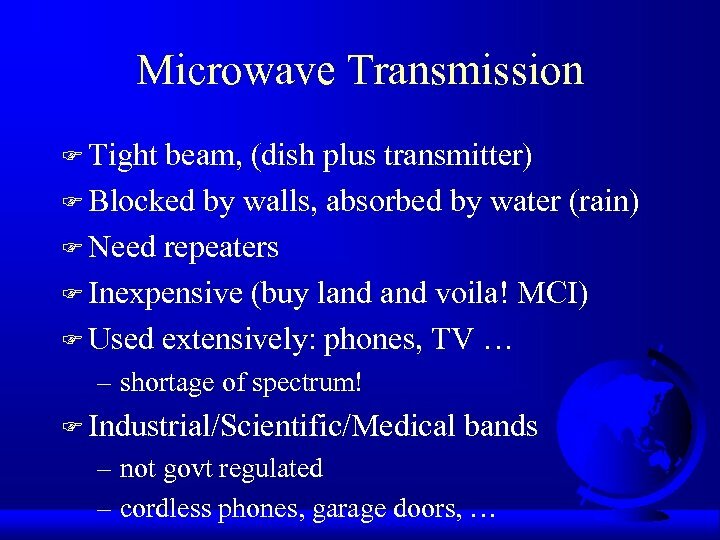 “White noise. 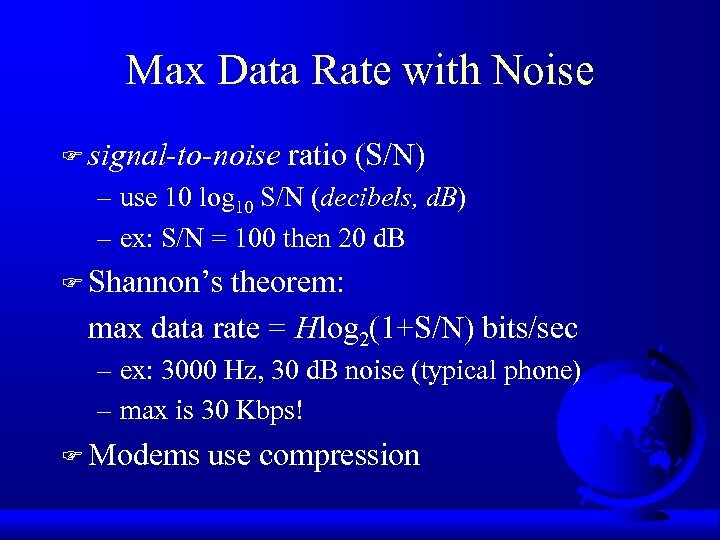 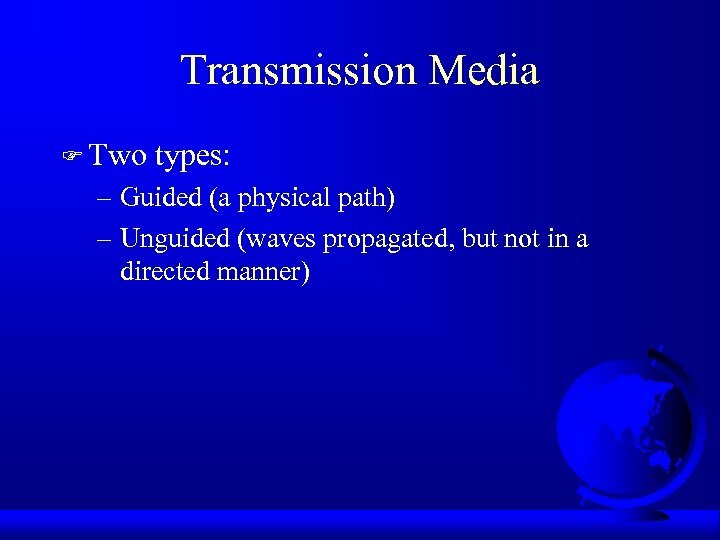 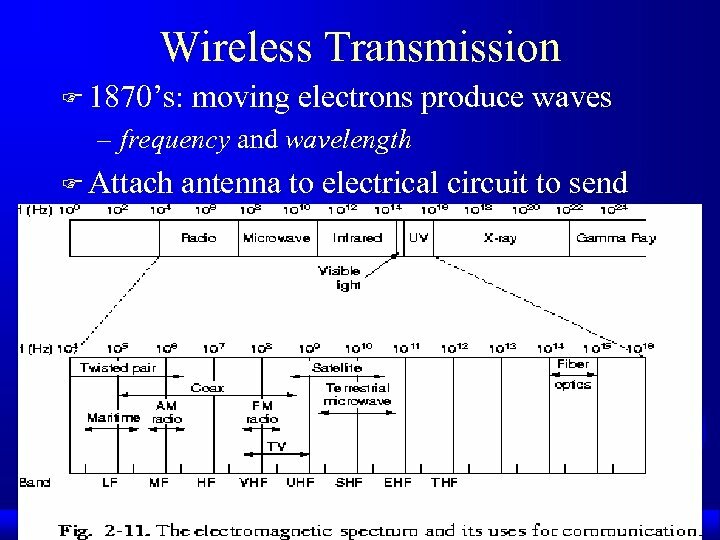 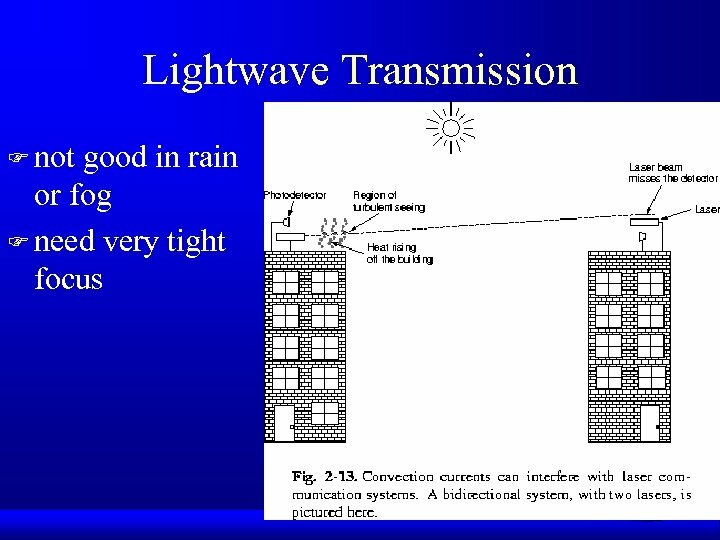 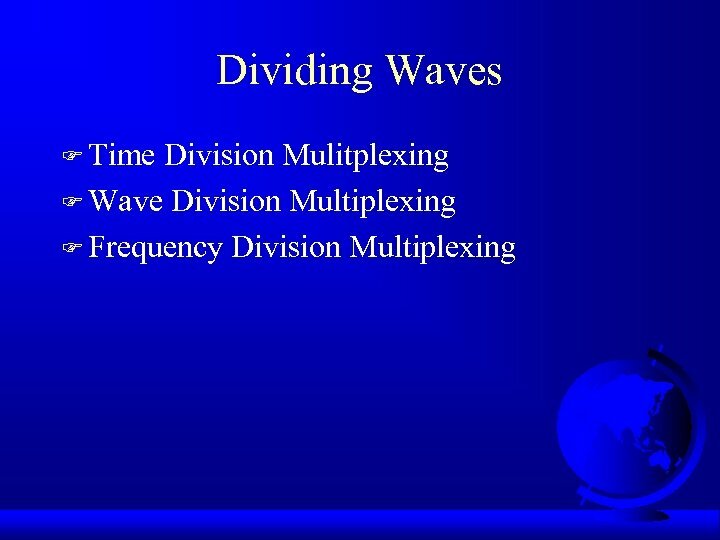 ” – Intermodulation noise different frequencies share the same medium – Crosstalk noise results from coupling signal paths u Ex: Other conversation (faintly) on a telephone – Impulse noise from sharp, short-lived disturbances u Ex: from lightning F Measure (or quantify) background noise? 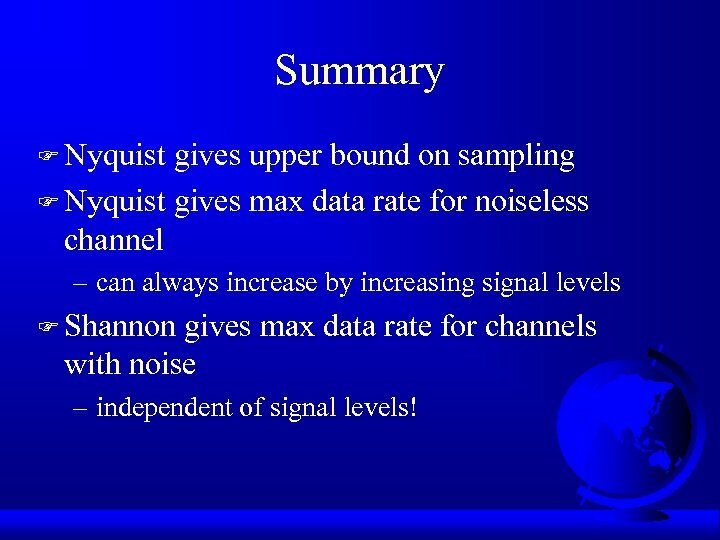 Summary F Nyquist gives upper bound on sampling F Nyquist gives max data rate for noiseless channel – can always increase by increasing signal levels F Shannon gives max data rate for channels with noise – independent of signal levels! 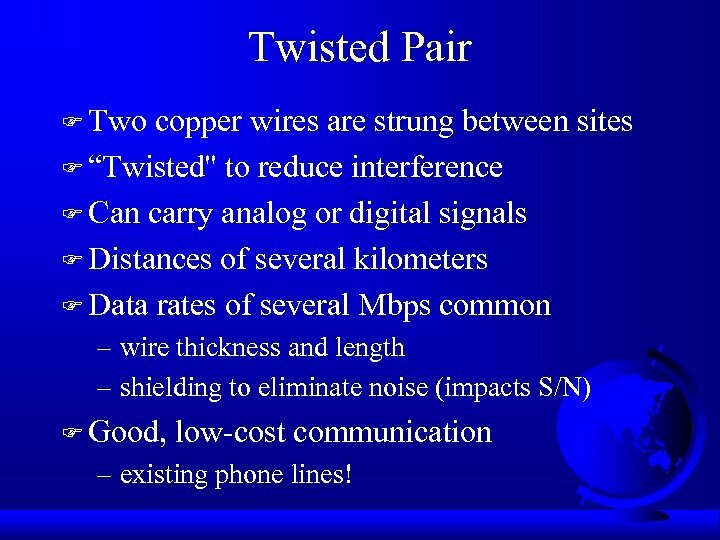 Twisted Pair F Two copper wires are strung between sites F “Twisted'' to reduce interference F Can carry analog or digital signals F Distances of several kilometers F Data rates of several Mbps common – wire thickness and length – shielding to eliminate noise (impacts S/N) F Good, low-cost communication – existing phone lines! 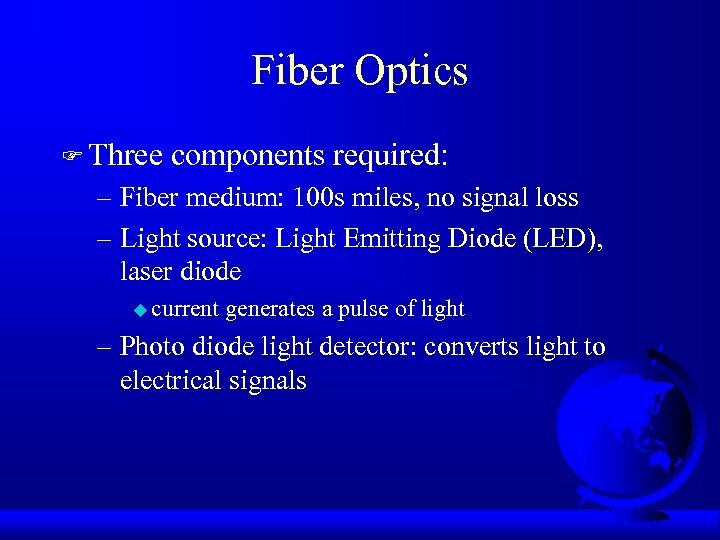 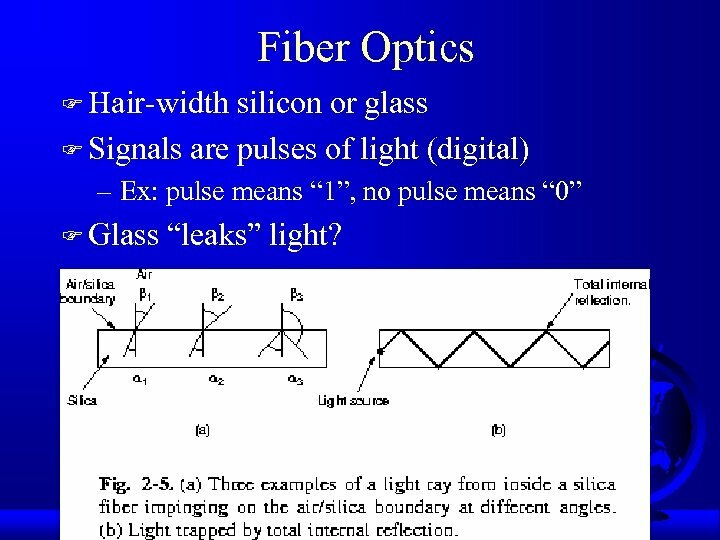 Fiber Optics F Hair-width silicon or glass F Signals are pulses of light (digital) – Ex: pulse means “ 1”, no pulse means “ 0” F Glass “leaks” light? 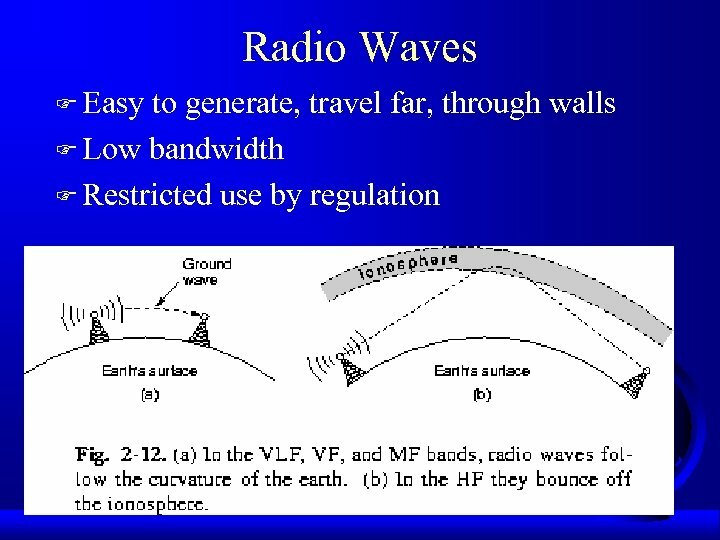 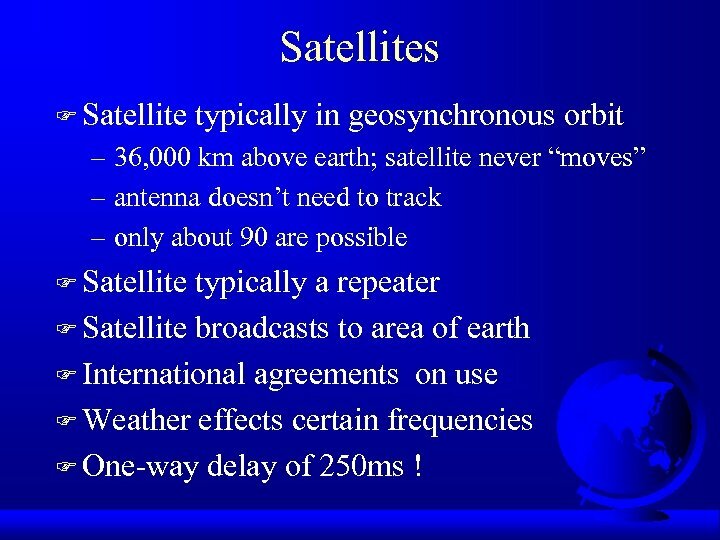 Satellites F Satellite typically in geosynchronous orbit – 36, 000 km above earth; satellite never “moves” – antenna doesn’t need to track – only about 90 are possible F Satellite typically a repeater F Satellite broadcasts to area of earth F International agreements on use F Weather effects certain frequencies F One-way delay of 250 ms ! 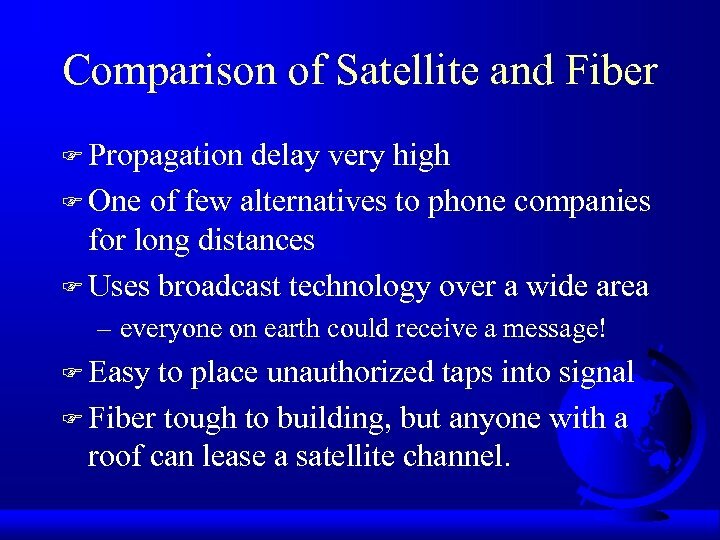 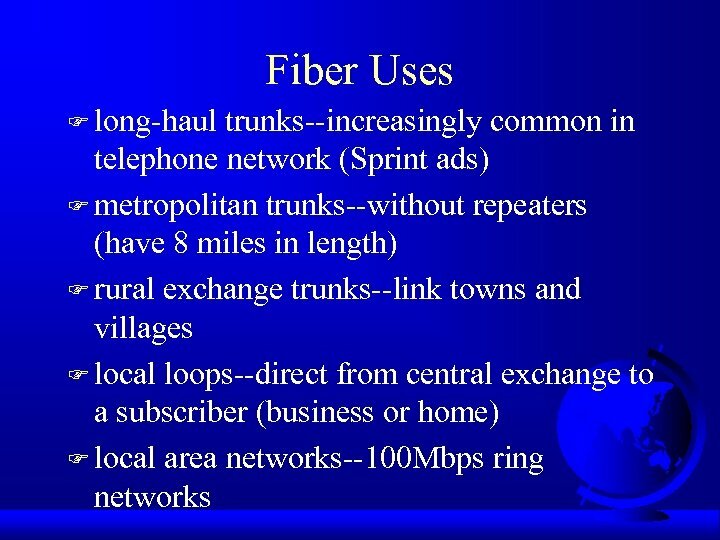 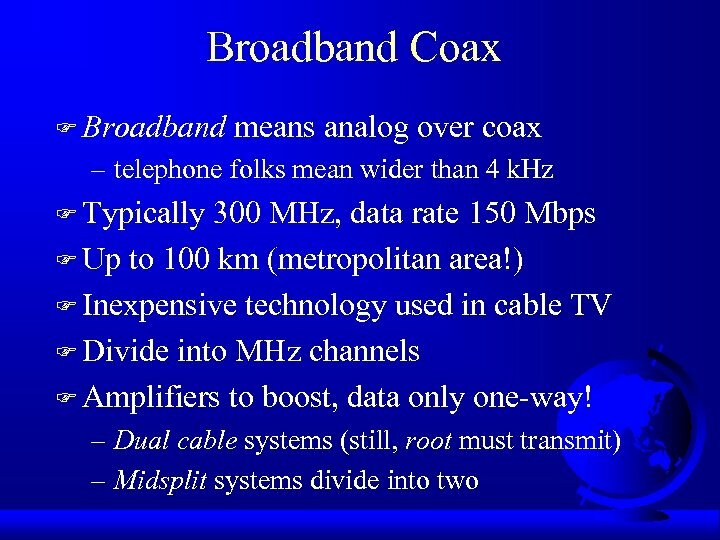 Comparison of Satellite and Fiber F Propagation delay very high F One of few alternatives to phone companies for long distances F Uses broadcast technology over a wide area – everyone on earth could receive a message! 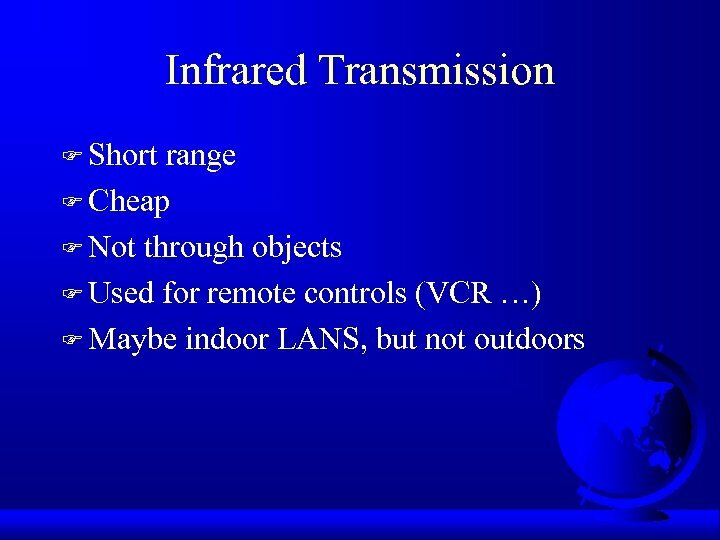 F Easy to place unauthorized taps into signal F Fiber tough to building, but anyone with a roof can lease a satellite channel.